The Keeling Centre for Ancient Philosophy in the Philosophy Department at UCL is the home of activities and events that focus on ancient philosophy. There is an annual lecture and a colloquium every 2-4 years, and a senior academic is appointed as the Keeling Scholar in Residence (currently Prof. Sarah Broadie). The Keeling Centre also offers graduate scholarships for research in ancient philosophy, and hosts visitors specialising in the field. During term time, Staff and Students of the Keeling Centre attend a weekly Greek reading group, co-convened with Kings College London, in which an ancient philosophical text is translated and discussed by participants over the course of the term. During the summer term, the Keeling Centre and Kings College staff and students meet to discuss work in progress. Staff and Students of the Keeling Centre organise and actively attend the fortnightly Ancient Philosophy seminar series, of the Institute for Classical Studies. Graduate Students at the Keeling Centre also run The Lyceum Society the London Intercollegiate Graduate Research Group, and co-convene a summer work in progress seminar with graduate students of other University of London colleges. The Keeling Centre is made possible by an anonymous donor, whose generous bequest in honour of S.V. Keeling aimed to promote the study of ancient philosophy at UCL, and in London. London Ancient Science Conference 2019 is sponsored by the Keeling Centre. 11th Feb - 15th Feb 2019. Details here. CFA: The first Keeling Graduate and Early Career Conference will be held on 17-18 May. Keynote speakers: Karen Margrethe Nielsen (Oxford) and Raphael Woolf (KCL). See Keeling events for more details. S.V. Keeling Memorial Lecture 2019: The S.V. Keeling Memorial Lecture will be given by Prof MM McCabe (KCL, Cambridge) on Thurs 14th March. More details soon! Keeling Scholar in Residence: The 2018-19 Keeling Scholar in Residence is Prof Sarah Broadie (St Andrews)! Prof Broadie will be convening a graduate seminar in the Spring term 2019. Daniel Vazquez (University of Sao Paulo) gave a talk on 'Teleology, Causation and the Atlas Motif in Plato's Phaedo' on June 20th 1pm, Seminar Room Department of Philosophy UCL. Keeling Memorial Lectures: The 2018/19 Keeling Memorial Lecture will be given by Professor M.M. McCabe, and the 2019/20 Lecture by Professor Ursula Coope! 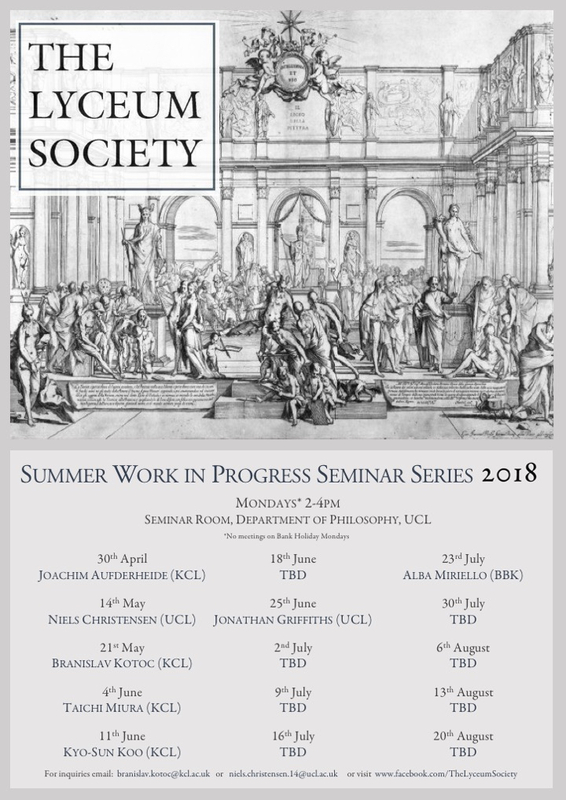 The Lyceum Society: Graduate Research Group co-run by graduates at the Keeling Centre and KCL - Summer Work in Progress Seminar Series schedule is now available. Summer 2018 Staff & Postdoctoral Research Work in Progress schedule now available. Exclusive Preview: Preview a pre-publication version of Prof Gail Fine's paper on Epistêmê and Doxa, Knowledge and Belief in the Phaedo here! Keeling Lecture: The 2017/18 S.V. Keeling Memorial Lecture was be given by Prof Gábor Betegh on Weds 21st March 2018. Keeling Scholarship: Applications for 2019/20 will open in Autumn 2018. Institute of Classical Studies: Details of the 2017/2018 ICS ancient philosophy seminar series are available here. Keeling Scholar in Residence: Prof David Sedley is the new Keeling Scholar in Residence from September 2017! Supplementary Keeling Lecture: Prof Dorothea Frede gave a supplementary Keeling lecture on Thurs 19th October 2017, 5pm-7pm. UCL-Yale Workshop: On Monday 22nd & 23rd May 2017 the Keeling Centre hosted a workshop on Virtue and Value in Plato and Aristotle. Keeling Lecture: Professor Anthony Long delivered the 2017/18 Keeling Lecture on Thursday 18th May, 2017. Paper Preview: A preview of Jessica Moss' paper for forthcoming proceedings of the 2011 Keeling Colloquium is available here!